Dan Post Boots makes Western-style footwear for men, women and children, because you're never too young to start wearing Cowboy Boots. 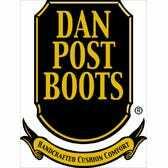 Dan Post Boots are designed to keep feet flexible and well-protected. Made with premium leather, high-tech features and tough safety materials, boots are available in low-cut and high-cut styles. The Cowboy-certified line of footwear is designed with Old West tradition and modern-day practicality in mind. Dan Post's McRae Industrial line of footwear is made for work, with integrated safety toes and lace-up, casual everyday styles. The Johnny Popper line from Dan Post Boots is made exclusively for kids, from newborn babies to big boys and girls aged 6. It's never too early to introduce them to stylish, protective boots. And it's never too late to discover why Dan Post Boots are so perfect as work-friendly, all-occasion fashion.